Osteoporosis is a condition marked by weak and brittle bones often leading to devastating bone fractures and other injuries. Millions of people worldwide are diagnosed with osteoporosis. Bones are dynamic organs that are constantly undergoing resorption and renewal. 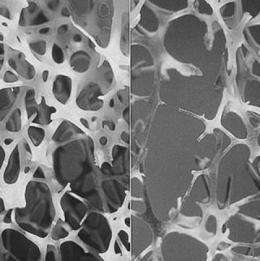 When bone resorption starts outpacing renewal, bone density decreases. Medical researchers are interested in finding ways to not only stop bone resorption but to generate new bone material. An ideal therapy would rejuvenate bone growth so that it reverts back to its original density levels. One promising area for accomplishing this is in cell therapy. A collaborative study by Wanqiu Chen, David J. Baylink, Justin Brier-Jones, Amanda Neises, Jason B. Kiroyan, Charles H. Rundle, Kin-Hing William Lau, and Xiao-Bing Zhang of Loma Linda University and Jerry L. Pettis Memorial VA Medical Center has built on their prior work with genetically modified hematopoietic stem cells (HSCs) to identify and optimize a growth factor that caused a 45% increase in bone strength in mouse models. Their work is reported in the Proceedings of the National Academy of Sciences. In an effort to find a gene therapy that promotes bone growth while minimizing side effects, Zhang's group focused on PGDFB (platelet-derived growth factor, subunit B) because several of its properties made it an enticing candidate. Additionally, PGDFB is already FDA approved for treating bone defects in the jaw and mouth. Their process for investigating PGDFB involved first isolating HSCs from donor mice. HSCs are preferred over other stem cells because these cells will home in to one of the major sites of bone loss, the endosteal bone surface. The extracted HSCs were then genetically engineered to overexpress PGDFB. The recipient mouse was irradiated before the modified HSCs were injected. The irradiation step, while necessary to prepare the mice, may be a barrier to clinical use, but the authors hope that future research will be able to eliminate this step. For now, the key to this experiment was to see how the recipient mice responded to PGDFB. After four weeks, the femur was tested. While Chen, et al. found that PGDFB promoted new trabecular bone formation, at high levels, it also negatively affected bone mineral density. To overcome this, they investigated weaker promoters to optimize the dosage of PGDFB expression in the HSCs. They found that phosphoglycerate kinase promoter (PGK) worked well to mitigate the amount of PGDFB that is expressed in cells. They observed increases in trabecular bone volume, thickness, and number as well as increases in connectivity density. Additionally, cortical bone volume increased by 20-30% while cortical porosity was reduced by 40%. Importantly, the lower dosage of PGDFB resulted in no observed decreases in bone mineral density due to osteomalacia or hyperparathyroidism. The treated femur and a control sample underwent three-point mechanical testing to test the integrity of the new bone. The PGK-PGDFB-treated femur displayed a 45% increase in maximum load-to-failure in the midshaft of the femur and a 46% increase in stiffness, indicating quality bone formation. The next step was to investigate why this combination of a PGK promotor and PDGFB worked. Previous research by Zhang's group had found that only FGF2 and, based on the current research, PDGFB are effective genetic factors for promoting bone formation. After conducting tests to investigate its mechanism, they found evidence for PDGFB promoting bone marrow mesenchymal stem cell formation and angiogenesis, two important factors in bone growth. They also found that optimizing the dosage of PDGFB was important for promoting osteoblast cell formation. Finally, Chen, et al. investigated how osteoclastogenesis, or the creation of cells that reabsorb bone, is affected by PDGFB with a PGK promotor. As it turns out, the treated femurs also had an increase in biomarkers for osteoclasts. This increase in both osteoblasts and osteoclasts indicates that the treated bones undergo the bone rebuilding and remodeling cycle. Overall, this research provides a compelling investigational pathway for future cell therapies to treat osteoporosis. Mouse models show a fast-acting technique that result in bone formation and increasing bone strength.